On my third day in Foz de Iguaçu, I took a short trip to the Itaipu Dam, a massive hydroelectric power plant situated on the Paraná River, which forms the border of Brazil and Paraguay. Opened in 1984, the dam was a binational project between Brazil and Paraguay to supply renewable energy to both countries. Currently, the dam generates 14,000 megawatts of energy annually, making it one of the largest facilities of its kind in the world. The dam supplies 75% of Paraguay’s energy and 17% of Brazil’s. The dam is considered one of the Seven Wonders of the Modern World. 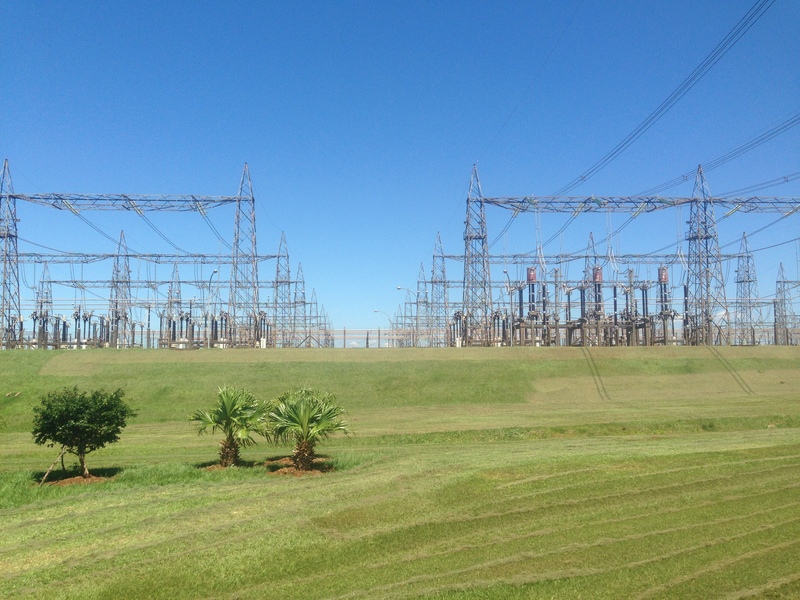 I went to Itaipu on a city bus from the TTU in Foz de Iguaçu. The ride takes about 30 minutes. Once you reach the Itaipu visitor center, you have the choice of taking a general tour around the outside of the plant or a more in-depth tour inside the plant called the Special Tour Circuit. Both tours provide information in English and Spanish in addition to Portuguese. I opted for the general tour. Before taking you around the grounds of the dam, visitors watch a somewhat propagandist film about the Itaipu Dam, triumphing the engineering feat and the benefits for the environment. After the film, I boarded the bus which travels around the grounds of the dam. The bus stopped twice for photographs. The complex is certainly an impressive sight. The dam is the size of several football stadiums and the generators are immense. The bus travels over to the Paraguay side of the river and offers a great view of the dam below as it travels across the top. I wish I had sat on the right side of the bus so that I could get better photos from up there. After my visit to Itaipu, a Brazilian friend of mine sent me some photos of the waterfall system that had been submerged in the construction of Itaipu. Guaíra Falls or the Sete Quedas (Seven Falls) had been one of the world’s largest waterfalls by volume and, in the photos, it looked as impressive as the waterfalls that I had seen over the previous two days in Iguazu. The photos got me interested in the other negative consequences of the Itaipu Dam and to uncover the side of the story that I didn’t get from my visit to Itaipu. For example, 59,000 people who had been living along the Paraná River were displaced from their homes due to the creation of the lake. In addition, 80 people who were trying to visit the Seven Falls before the national park closed died in a bridge collapse. Itaipu Dam also involved destruction of surrounding forest, displacement of wildlife and other changes to the ecosystem. 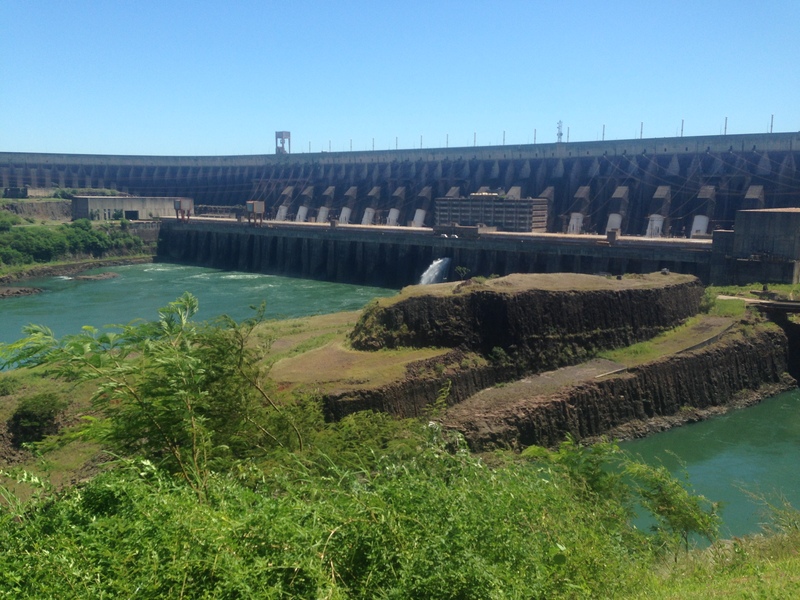 While one could say that Itaipu’s damage has already been done, controversy over hydroelectric dams is part of Brazil’s present day politics. The Belo Monte Dam is currently being constructed on the Xingu River, a tributary of the Amazon River in the state of Pará. The dam will divert 80% of the Xingu’s water, clear 1,500 kilometers of rainforest and displace 20,000 to 40,000 people, many of them belonging to indigenous Amazon tribes. Brazil’s military dictatorship had originally proposed seven dams along the Xingu and Iriri Rivers in the 1970s; however, a coalition of environmentalists and indigenous groups successfully thwarted these plans in 1989. The Lula administration revived a more scaled down version of the project in 2003 and the Brazilian Congress approved these plans in 2005. Ever since, the project has been mired in lawsuits and controversy. Environmentalists believe that the project is not needed for Brazil and that alternatives could be employed that will have much less of a negative impact. Additionally, there has been controversy about treatment of workers at the Belo Monte site. In reality, any place you visit has its official story, the face they want to show to the public and often sweeping any negative details under the rug. My visit to Itaipu Dam reminded me that places, often historic places, have stories that you won’t find on plaques or in a video at the visitors center. There is no information there about the Seven Falls that lie buried underneath the complex of concrete. That said, I am very glad I visited Itaipu. It is a window into Brazil’s history and the complex environmental issues that it and the world face today as we seek ways of creating energy.